Do you keep your eyes (and ears) open when you’re out and about? Can you see the dog in this picture? Meet Bear. Bear has been tied out side 24/7 since he was a baby. His home is a volunteer-made insulated dog house, and he is forced to eat, sleep, crap and pace in one small area, by a chain no longer than the length of your body. Bear’s owners have another dog, that is allowed to roam free (thanks to an electric collar), and is allowed inside on crappy days and even crappier nights. Bear’s doghouse is so far from the house, that it makes it difficult to get to on snowy days, and slow to get to if Bear is in trouble. How do I know about Bear? This past weekend, my husband, James, and I volunteered for clean-up day with Gordy and Friends. This group is a small, but powerful group out of the Fingerlakes, New York area whose main purpose is to provide food, water, shelter, toys, treats, socialization and a safe and hygienic pen area to outside dogs that are chained up 24/7. In addition, owners are educated on, and shown by example, the wonderful, awesome ways to be a responsible and conscientious dog owner. The majority of dogs chained or tethered outside 24/7 do not receive ANY interaction. They are also not always given food and clean water on a daily basis, and as far as fleas, flies ticks, spiders and ants – if the owner isn’t providing food and clean water every day, do you think they are even thinking about protecting that dog from outside elements; whether it be environmental or insects? The majority of these dogs are forgotten. They are isolated, un-exercised, not touched or played with, and go un-bathed. They are not checked regularly for illness or injury. Their nails are not clipped, they teeth are not cleaned, and their doghouses stay dirty and buggy. They are left to linger their days in solitude, boredom and well, misery. I heard about Gordy and Friends when I came across two dogs in a very poor outdoor 24/7 living situation in the next town over where I live. Because these two dogs just squeaked past the guidelines in the NYS Department of Agriculture and Markets Article 26, there was nothing much that could be done about how these lovely, neglected dogs were being treated, and not-treated. 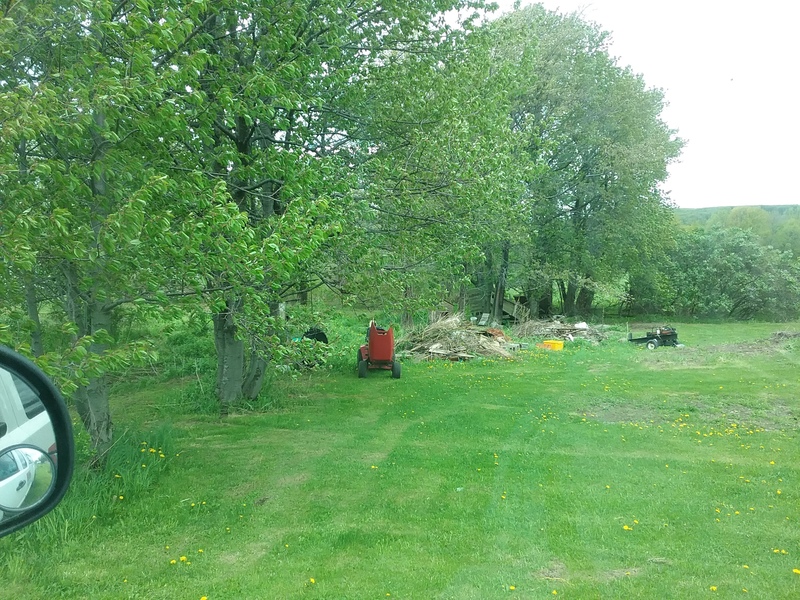 The last time I went on the property to check on them, I was informed that my being there could be construed as trespassing and therefore breaking a law. So, I had to find another way to check on these two dogs on a regular basis, and it was then I was put in touch with the founder of Gordy and Friends, who were all too happy to help them. Our Saturday consisted of going to homes where known dogs were kept outside 24/7 in poor conditions to give them boredom alleviation in the form of treats, pets and walks, and to clean up their pen areas to they wouldn’t be walking around in their own filth. The first home consisted of three dogs, (one of them injured and sick – that Gordy and Friends has been working on with the owners). The dogs were very excited and happy to see us, and demonstrated that by jumping and barking. I got my first taste of the owners when the window to the house opened, and she yelled out for the dogs to shut up. Window closed again. And you wonder why I dislike people, in general, so much. Once I got past my tears (there were A LOT that morning), I tried to look past my anger and disgust at the owners and the neglectful situations they put their dogs in, and instead, try to focus on what a wonderful thing we were doing to for these dogs who had come to recognize the Gordy and Friends’ Truck every week and were oh, so happy to see us. Some of the dogs wanted walks so they could poop outside of their area and/or run and stretch out on grass, others just wanted to sit and lean against you so they could be touched and petted and have soothing words whispered in their ears. Every dog we met (except for one a little too feisty for non-regular volunteers to care for) was kind, gentle and so happy to be getting some attention, treats and exercise. I wanted to take them all home, and of course, put the owners in their places. What do you need to be a volunteer for clean-up day with Gordy and Friends? Saturday was wonderful and terrible all at the same time. The founder of Gordy and Friends, Kathy W., kept referring to these dogs as heroes. But truly, I think the real hero in all of this is Kathy. She saw a need, and her passion and drive to do the right thing for these animals turned into Gordy and Friends. And just like that, dogs were being helped in so many great, giving ways. All of the dogs that we visited on Saturday all fall within the “acceptable” guidelines for New York State. That means, no NYS authorities will take action to further help these dogs. And THAT has to change. There are many endeavors in the works within NYS right now to change some of the guidelines of Article 26. If you want to find out how you can help in that endeavor, please reach out to us. 24/7 Outside Dogs are ALL OVER. You can reach out to Gordy and Friends to ask about volunteering, or donating. Dogs receive 100% of every donation, and donations are always welcomed. If YOU see or know of a 24/7 outside dog, please, make the effort to JUST DO SOMETHING to help make a difference. If you’re not sure of how to help that dog, reach out to us. James and I have already committed to going back to volunteer with Gordy and Friends soon. 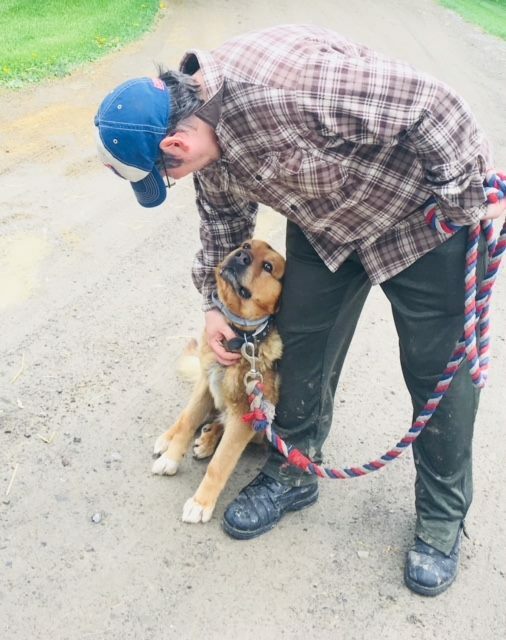 In addition to clean-up days, they have specific agendas for some of the outside dogs to get them into better living situations, and they always welcome committed people who simply want to help make a difference. Did you find the dog yet? If you were driving by too fast, you might never have seen Bear jumping up behind the red tractor, trying to get us to notice him as we pulled up. THAT is the life of an outside dog chained up 24/7.